The Two of Swords reversed suggests that you are facing a difficult decision and cannot decide which direction to take. You are caught between a rock and a hard place, and it feels impossible to make the ‘right’ decision as you believe either option will lead to negative consequences. As a result, you are finding yourself feeling stuck and unable to move forward, which is just making the situation worse. You may also lack the information you need to make a sound decision. Just as the blindfolded woman is closed off to the external world, you may also be closed off to additional information or alternative solutions that could resolve your dilemma. Or, you might be experiencing information overload, overwhelmed by other people’s points of view and a deluge of information. Sift through the advice available to select only the most relevant and helpful. The reversed Two of Swords is inviting you to listen to your intuition about this difficult decision. You may need to cut off from the external world temporarily so you can hear your inner voice and allow your wisdom to come through. Trust what you know to be true and right for you. Make your decisions based on your own internal compass. 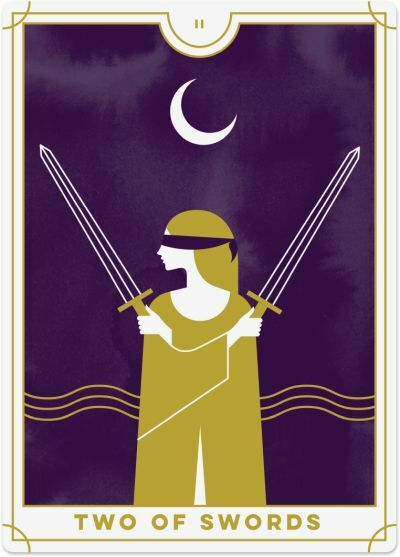 The Two of Swords reversed often represents a stalemate. You may reach an impasse with a friend, loved one, colleague or supplier. The trouble is that all parties involved are refusing to see the situation from the other's perspective and you are butting heads. Remove the blinders and look at the situation from a different angle. Identify where you can come to a compromise. Otherwise, this issue will not move forward. The reversed Two of Swords may also suggest you are feeling stuck in the middle of two competing sides. You may be trying to play the peacemaker role, but in doing so, you are just confusing yourself and creating more tension. For example, you may attempt to bring two conflicting family members together in the hope of fostering a harmonious family environment, but instead, you end up being the messenger or the dumping ground for each of their concerns. Decide whether you honestly have a role to play and whether you can create peace between the two opposing parties. Otherwise, get yourself out of there!